LOUISVILLE, KY (December 2, 2016) – Carey Brown, the Kentucky Cattlemen’s Association (KCA) publication coordinator, was named the winner of Kentucky Farm Bureau’s (KFB) 2016 Communications Award. 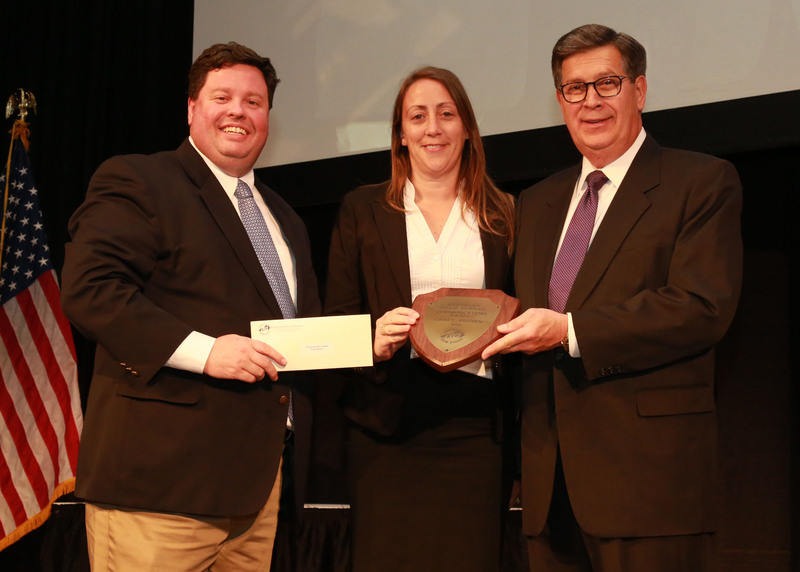 She was recognized on December 1 during the general session of KFB’s annual meeting at the Galt House in Louisville. The Communications Award, which consists of a plaque and $300 cash prize, has been presented by KFB annually since 1960. Media outlets, county Farm Bureaus and other agriculture-related agencies nominate candidates whose outstanding journalism work has created a better understanding of Kentucky’s agriculture industry over the last year. Carey Brown (center) received the 2016 Communications Award at Kentucky Farm Bureau’s annual meeting in Louisville. Presenting the award is B. Todd Bright, KFB Communication Division Director (left), and David S. Beck, KFB Executive Vice President (right). Bath County Farm Bureau nominated Brown for the outstanding work she produces on behalf of Kentucky agriculture. Her career with KCA began nearly 15 years ago beginning as an intern and taking over the organization’s publication, Cow Country News, in 2002. That publication keeps KCA membership updated on current local, state national and international issues related to agriculture and specifically the cattle industry. Brown is responsible for all duties related to the publication including advertising, editorial, graphic design and layout. She is also responsible for the Animal Shelter Assistance program, offered through the KCA Foundation. This program offers assistance to animal shelters and helps build the relationship between animal control officers and shelter staff with local cattlemen. Brown has also worked with the American Black Hereford Association’s magazine and with the Kentucky Dairy Development Council. She comes from a farming background having grown up in Bourbon County on a cattle and tobacco farm. Brown has served as a member of the Livestock Publications Council, the American Agricultural Editors Association and the Ag Media Summit Planning Committee.